Get insight into the operation and utilization of Amazon SNS through CloudWatch and CloudTrail sources. Get a complete picture of the SNS metrics with a detailed breakdown of messages published and received, and notifications that succeeded and failed. 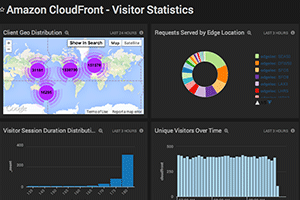 Use pre-configured searches and visually rich dashboards that provide real-time, as well as historical trends, visibility into your SNS environment. Leverage an understanding of historical behavior to plan future capacity and control access to specific publishers and subscribers. Amazon SNS is an AWS service that coordinates and manages the receiving, queuing and delivering of messages to endpoints. Publishers or producers send messages on a topic while subscribers or consumers receive messages by listening to the topic. The topic functions as a logical access point and communication channel between the two. Subscribers can be web servers, email addresses, Amazon SQS queues, or AWS Lambda functions that communicate using protocols like HTTP/S, email, Amazon SQS, SMS, or Lambda. Using Amazon SNS, you can manage access and maintain control over which subscribers can listen in or which publishers can send messages on the topic, and under what conditions. The service allows users to create a topic, unsubscribe from it, or delete it through a simple console. It can also be used with the AWS SDK for embedding a pub-sub model inside java code. Get started today. The setup to collect metrics and events from Amazon SNS is simple and easy to follow, so you’ll be ready to go in no time. Metrics collection requires two simple steps of configuring a hosted collector and an Amazon CloudWatch Metrics Source. For events, an AWS CloudTrail Source needs to be added to the hosted collector. Once these basic steps are complete, the app is ready to start receiving data from the SNS. Don’t miss a thing. Gain continuous intelligence using the dashboards in the app, and troubleshoot issues quickly with real-time data collection. 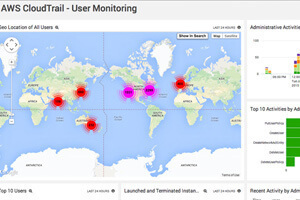 The dashboards provide an exhaustive overview of your SNS service including successful and failed events, messages published, notifications, and users. These can be grouped based on application, platform, region, and topic name for further clarity. Count and location of successful and failed events in the last 24 hours on a world map. Count and percentage of successful and failed events in the last 24 hours on a pie chart. Sum and average of notifications delivered and failed in the last 24 hours for different regions and topic names. Number of messages published in the last 24 hours on a line chart. Top ten users by event count in the last 24 hours on a bar chart. Event trend by event name in the last 24 hours on a stacked column chart. Difference between the number of messages published in the last two days on a line chart. Difference between the metrics publish size in the last two days on a line chart. See the full documentation on Amazon SNS, and start optimizing your install today.